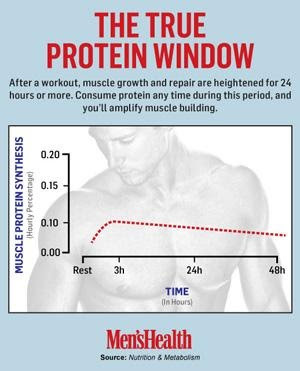 Leave it to our friends over at Men's Health to cut through all the mumbo jumbo on taking in protein after we workout and shed some light on the bare facts. So what does this new research tell us about post workout nutrition? That a protein shake within an hour after you workout is indeed important, but so it the 48 hours following an intense workout. So, keep eating those eggs and chicken breasts people!